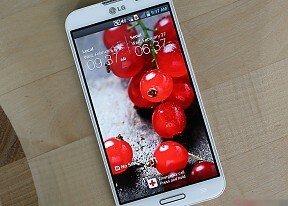 The newly announced Optimus G Pro books LG a spot in the Android hall of fame. A quad-core Snapdragon 600 chipset, a 5.5" FullHD display and a 13MP camera is the right kind of ammo of a proper flagship. The bar has been consitently raised over the past few months and only this sort of specs can get you a pass into the exclusive club of uberphones. The quad-core race is on for some time now, but display technology has been coming in leaps and bounds as well. Displays of 5+ inches in diagonal and 1080p resolution are all the rage now and we are seeing new models touting those cropping up every month. Yesterday's flagships are demoted to runner-ups by this new breed of five-inchers. The LG Optimus G is one of the first victims in this arms race, outsmarted by the company's own Optimus G Pro. But it's a cut-throat business and specs alone cannot guarantee strong sales. It takes a bit more than that. The stakes are high indeed, but the Optimus G Pro seems to have what it takes to make it through. We took one for a spin and are ready to let you in on all we managed to find out about it. But let's start with the spec sheet. The Optimus G Pro has one of the most powerful chipsets around and has an intriguing screen. It's both bigger and better than the one on the the Xperia Z and that's a clear message already. There is the sleek design too, the slim screen bezel and the Android Jelly Bean edition enhanced by numerous custom tweaks and eye-candy. Join us as we look closely at what makes the LG Optimus G Pro tick. I need a quick response fro you guys, does this phone LG g Pro uses a Sim card? The s4 has just been released and everybody's talking about it and comparing it to HTC one and Xperia z. LG is not even mentioned, after trolling in NY ads. Truly LG is dead without nexus. Thank me for adding to LG's popularity. LG Optimus G Pro preview: First look is very good mob....in india ...but i have no word this is very importmant mob...so..